Adrian Beehner took a leap of faith in a new program, and has earned his bachelor’s degree in computer science in Coeur d’Alene. After finishing his associate’s degree at North Idaho College (NIC), Adrian Beehner took a leap: He applied and was accepted to the computer science program at the University of Idaho Coeur d’Alene. His leap paid off. When he graduates in May, Beehner will be the first graduate in the program, which is a partnership between U of I’s College of Engineering and NIC. “I was the one who took the leap,” he said. When Beehner graduated from NIC in 2016, he was preparing to move to Moscow to complete his bachelor’s degree. But then U of I and NIC announced a four-year computer science program. It allows students to complete two years at NIC, then two years at U of I Coeur d’Alene through the Department of Computer Science. “All of a sudden there was a huge opportunity. It was such an easy process, U of I just checked my transcript and I was good to go,” he said. A native of the Silver Valley, it was important to Beehner to stay close to home when he started college. “I wasn’t sure what I wanted to do yet. I wanted the opportunity to explore options without leaving my family,” he said. Beehner considered becoming a dentist and started studying biology at NIC. Beehner grew up playing video games. Adrian Beehner talks about computer science with faculty member John Shovic. After transferring to U of I Coeur d’Alene, Beehner was able to immediately start the upper-division courses to finish his degree in computer science. “U of I was really different because you have choice in exploring different topics. It was a huge eye-opener to be involved with robotics here,” he said. 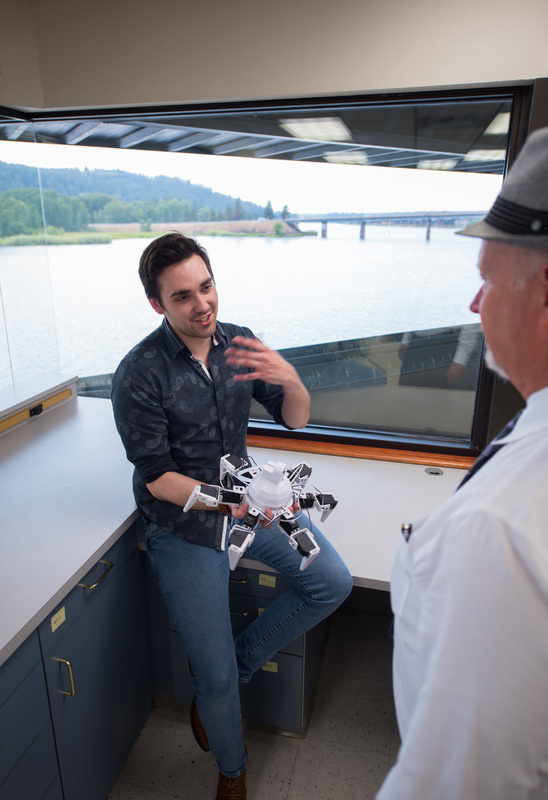 Beehner was involved with projects revolving around Baxter, a humanoid robot weighing about 400 pounds and located in U of I’s new Innovation Den in downtown Coeur d’Alene. Beehner helped program Baxter to make coffee with a Keurig machine. “That was some of the coolest stuff I’ve done,” he said. Beehner hasn’t decided what’s next yet.